DISCLAIMER: This is a work of revisionist fanfiction for my personal entertainment (and maybe yours). Dragon Age II and all related characters and locations are the property of Bioware Inc. RATING: Grown ups. Act III begins six years following the departure of the Qunari. Meredith and Orsino are arguing in the Hightown courtyard. 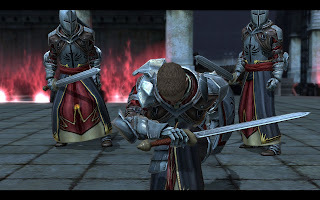 Hawke approaches and may choose a side, but the argument is ultimately broken up by Grand Cleric Elthina, who sends Meredith and Orsino back to their rooms, demanding that they try to see reason and suggests Hawke speak with them. When Hawke speaks with Orsino, they discuss the problem of demons and blood magic in Kirkwall. Orsino speculates that Kirkwall's history of violence and suffering at the hands of the Tevinter Imperium likely has made it a very attractive place for demons. He laments that it is probably not the best place to maintain a Circle, as the temptations for mages are great, but he stresses that the mages within the Circle under his tutelage are not to be feared. 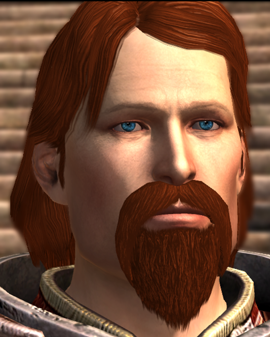 If Anders is in party, he will argue that Orsino is not doing enough to end the oppression of mages. 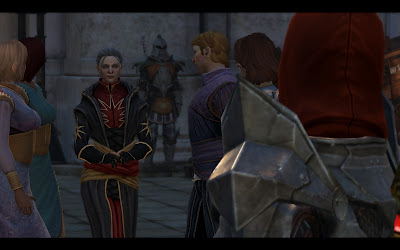 Orsino replies that, while he agrees that mages require more freedom, he does not disagree with the overall principle of the Circle and the Chantry, believing that the temptations presented by magic are too great to simply allow mages to stroll around as they do in Tevinter, citing, with great remorse, the events that led to Hawke's mother's death. He is certain that eventually, Meredith will use such examples as an excuse to request the Right of Anulment from the Grand Cleric, if she has not already done so. 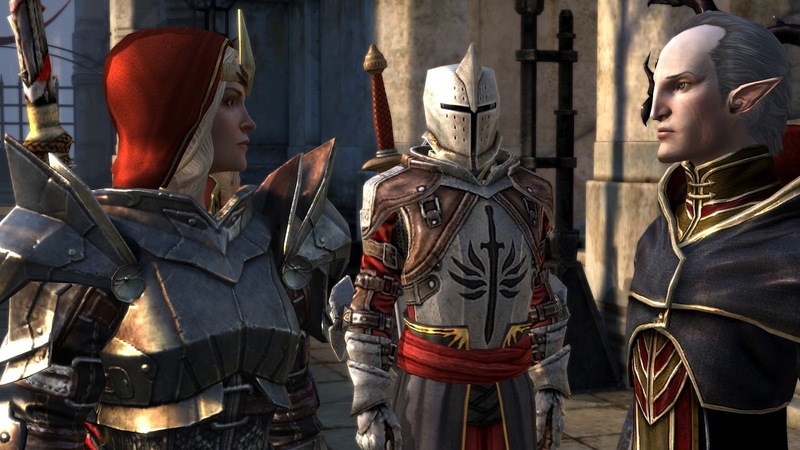 When Hawke goes to speak with Meredith, she finds Sister Petrice leaving the Knight-Commander's office. She pauses to exchange words with Hawke that allude to a rivalry between them that has developed over the past six years. If Hawke had previously sided with Petrice at all in the past, Hawke can discuss this, but it is evident that Petrice has no intention of working with Hawke ever again, nor does she need to, since her only concern had been to rid Kirkwall of the Qunari. In speaking with Meredith, Hawke confirms that Meredith has no plans to step down from her Chantry-appointed position as steward, as no suitable replacement has stepped forward. Hawke can suggest herself, but Meredith shrugs this off, claiming that Hawke might have saved the city from the Qunari, but she has no place in politics. If Anders is in party and/or if Hawke is a mage, Meredith will threaten to arrest them when the issue of how the templars are treating mages is raised, stating that they have only been allowed to roam free because of Hawke's champion status. Thrask risks approaching Hawke with his concerns over Meredith and requests that Hawke meet with Grace at the Circle to see the situation for herself. Hawke may report Thrask's concerns to Knight-Captain Cullen, but, while Cullen agrees that there are concerns, it is evident that he is the Knight-Commander's man and does not believe the concerns are great enough to cause alarm. He does promises to speak with Thrask about it. Anders demands to be included on this mission and together, they meet Grace, who leads them through the Circle. Hawke is able to talk with several mages, including Bethany, if she is there, who give varying accounts of their treatment at the Circle. Finally, Grace leads them to the dungeons and Anders relates his experience in solitary confinement at the Ferelden Circle. Grace admits that such punishments and worse take place frequently there, but that is not the real reason why Grace led Hawke there. 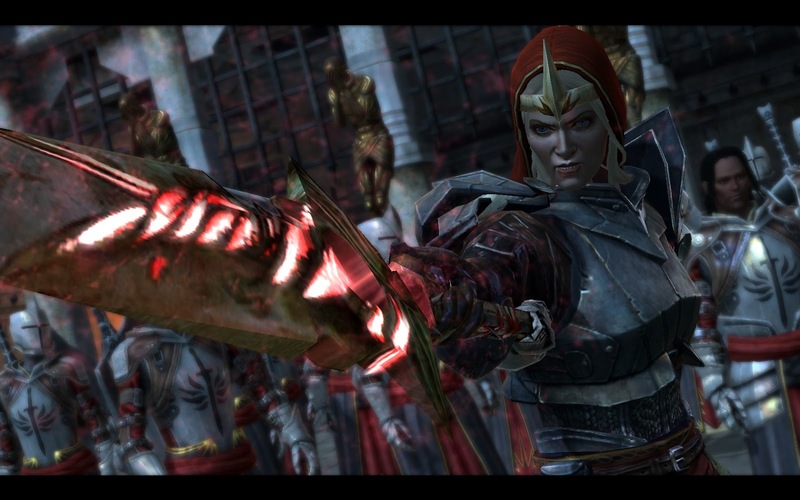 Hawke is then ambushed by several blood mages, led by Grace, who wants revenge for Hawke's murder of her lover, Decimus. Hawke defeats the mages, but Grace escapes. 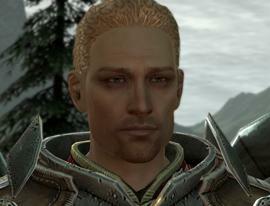 Hawke receives a message from Cullen, and meets him at the Gallows. If Hawke previously discussed Thrask's concerns, Cullen will inform Hawke that Thrask has gone missing. If Hawke did not previously speak with Cullen, he says that he is investigating Thrask, who may have illicit dealings with mages and Cullen indicates that he knows Hawke had dealings with him in the past. Hawke can express Thrask's concerns over Meredith here again or for the first time and Cullen will say or reiterate that he does have concerns with Meredith's increasingly harsh methods, but is bound to Chantry law. He thanks Hawke for the information provided and indicates that he hopes to learn more from Samson. Hawke may speak with Samson, but he will not divulge any information, only warning her of trouble brewing. Hawke receives a letter from a Sister Nightengale, requesting a rendez-vous at the Viscount's Keep at night. Hawke is attacked by a group of Resolutionists, who believe she is working with an agent of the Chantry intent on destroying all mages in Kirkwall. The agent reveals herself at the end of the battle, killing the remaining mages after she learns that they were tipped off to this meeting by someone within the Kirkwall Chantry. She explains that the Divine has received word from a member of the Kirkwall Chantry warning of serious issues between the mages and templars, and takes the Resolutionists' attack as proof of the concern. The Divine wants the Grand Cleric to leave Kirkwall for her own safety. Sister Nightengale requests that Hawke deliver this message to the Grand Cleric. At the Chantry, the Grand Cleric will refuse to leave her "flock," despite Petrice's concerns over the Grand Cleric disobeying the Divine's order. The Grand Cleric points out that no actual order was given. If Sebastian was recruited, he will also plead with the Grand Cleric to leave, but she will refuse. Side quest: King Alistair or Queen Anora will summon the Champion to speak about Lothering refugees, offering them the opportunity to return to Ferelden. When Hawke arrives to meet the monarch at the Viscount’s Keep, they will be arguing with Meredith about the fact that some of the refugees may well be mages that Meredith will not allow to leave, despite Anora/Alistair’s claims that mages would be taken to the Ferelden Circle. Meredith comments that she’s heard about the leniency of the Ferelden Circle and has no intention of allowing these mages free. Meredith leaves and Alistair/Anora request Hawke’s help. If Hawke agrees, she meets with Alistair/Anora’s contact in Lowtown and leads the refugees to the Docks. There, Alistair/Anora thanks her, apologizing for the trouble caused and inviting her to return to Ferelden. If Aveline is in party, a special invitation will be made to her as well, but both will refuse. Side quest: Nathaniel Howe, a Grey Warden sibling, Warden-Commander Alistair or Warden-Commander Stroud will contact Hawke, requesting her presence in the Deep Roads. Varric will accompany Hawke. There, they learn that the Grey Wardens have concerns about the paths she took in the Deep Roads and the artifact she found there. They believe the artifact may have something to do with the Architect and others like him, and that there may be more such idols in existence. Varric will tell them of what happened to his brother. Hawke guides them towards their destination. If the Legacy DLC is available, Hawke will be attacked by dwarves and they will mention something about Corypheus, rousing the Warden’s suspicions. If a sibling is present, the Warden-Commander will give permission for the sibling to join Hawke on an investigation into the matter. After fighting a few more Darkspawn, Hawke departs, while the Wardens continue on. When accessing her estate at some point, Hawke will be attacked by a group of assassins. Hawke defeats them, but misses one, who is stopped by an elf who reveals himself to be Zevran and confirms that the assassins are Antivan Crows. If Zevran did not survive Origins, or was not recruited, the saviour will be another Crow. The (former) Crow informs Hawke that someone in Kirkwall very much wants Hawke dead if they hired the Crows to assassinate her but, with a chuckle, he notes that someone else wants Hawke alive, since they hired an assassin to assassinate the assassins. When Hawke demands to know who hired him the assassin presents Hawke with a tempting offer that is made more enticing if Isabela is present. If Hawke accepts, she will learn that the assassin had actually been approached by a member of the Chantry to kill Hawke, but turned it down for the better offer of keeping her alive, which clearly has worked to his advantage. If Hawke does not accept, he merely tells her that the nobles of Kirkwall seem to care a lot for their Champion. Orsino requests Hawke's help in finding three escaped mages before the templars do. None of the mages are blood mages, and each has a valid, emotional reason for trying to leave. Hawke has the option to allow them to escape, to return them to the Circle, or to kill them. When she returns to Osino, Cullen and Meredith burst in and Meredith accuses Hawke and Orsino of conspiracy. 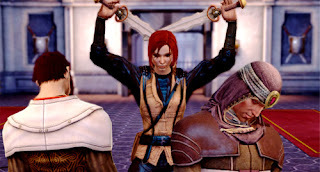 If Hawke has killed any of the mages, then Orsino condemns her for her actions, while Meredith praises her, saying that apostates deserve no mercy and making a sarcastic comment about Hawke, if she is a mage, and her companions. If Hawke allowed any of the mages to escape or returned them to the Circle, Meredith will become livid, ordering Cullen to hunt down the apostates and take Hawke into custody. Cullen is reluctant to do the latter and Orsino points out that the people who want Meredith removed from power would surely take offense to Meredith harming the Champion. The encounter ends in a standoff with Meredith warning that Hawke is not above the law and Hawke replying that the same stands for Meredith. Anders will request Hawke's help with a little project to separate himself from Justice. If Hawke refuses to help on the grounds that she doesn't trust him, Anders will guilt trip her into helping him find the material anyway, and continue on to ask Hawke to distract the Grand Cleric in the Chantry. The Grand Cleric is speaking with Petrice when Hawke arrives, informing her that her title of Mother has been returned due to her efforts and renewed commitment to the Chantry. Petrice humbly accepts and steps back to allow Hawke an audience with the Grand Cleric. When Hawke speaks with the Grand Cleric, she can pursue the lame distraction act. If Hawke chooses to warn the Grand Cleric that Anders is up to something, Petrice interrupts her before she can say much and, when Anders joins them, Petrice manages to take the Grand Cleric away. Cullen will ask for Hawke's help again in his investigation into the missing templar, Thrask, as other templars have gone missing and their have been reports of secret meetings, but he cannot gather the information himself. Hawke, amused, surmises that he needs her to question more people in The Blooming Rose and The Hanged Man. Hawke's investigation leads her to several groups of hostile mages and templars secretly meeting around the city. When Hawke reports back to Cullen, he directs Hawke to Meredith's office. Orsino is present, along with Petrice, who looks on smugly. Hawke makes her report and Meredith and Orsino immediately accuse each other of involvement, with Meredith shouting about blood magic, and Orsino accusing her of madness. Petrice interrupts, making her best attempt to sooth both parties and suggests that Hawke continue helping Cullen with his investigations to get to the bottom of this. Hawke receives a letter demanding she come to the Wounded Coast, where her sibling, lover or friend is being held captive. She is warned to speak to no one about this, but, if Hawke has a dialogue with Cullen, the option to tell him is available and he promises to follow at a safe distance and await her signal. At the Wounded Coast, Hawke receives another warning from Samson and is later ambushed by a group of templars and mages led by Thrask and Grace who are holding Hawke's sibling/lover/friend hostage. Grace has convinced Thrask that Hawke tried to kill her at the Chantry and that she is in league with Meredith. Hawke convinces Thrask that it was Grace who tried to kill Hawke. 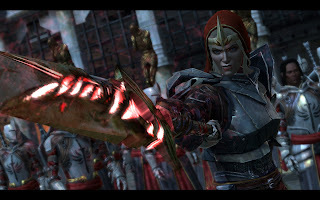 Thrask demands the release of the prisoner, telling Hawke that he had not intended to hurt them, but needed Hawke's help as Champion to deal with Meredith. He apologizes for doubting Hawke and demands an explanation from Grace, who instead kills Thrask, as per Best Served Cold. Whether or not Hawke spoke with Cullen earlier, he arrives with Samson and asks Hawke to determine the fate of Samson and the surviving mages and templars. Finally, Hawke receives a letter from either Meredith or Orsino requesting her presence in the Gallows as per The Last Straw. When Hawke arrives, a messenger informs her that Meredith and Orsino are on their way to the Chantry after Meredith demanded the Circle Tower be searched under suspicion of blood magic. Hawke finds the two in Lowtown. Their argument is interrupted by Anders, followed by the explosion of the Chantry. Meredith uses this as an excuse to declare the Right of Anulment, but Orsino argues that this is no time to feed her blood thirst against mages when there may be survivors who must be helped. But a bloodied and bruised Petrice arrives with a few clerics, informing them that they had been returning to the Chantry and only just escaped the brunt of the blast. They are the only survivors and she confirms that, with no Grand Cleric present, Meredith is within her rights to enact the Right of Anulment. Sebastian argues that only Anders should be punished and Anders agrees, but Meredith doesn't care, demanding that Hawke choose a side. A battle ensues once Hawke decides. 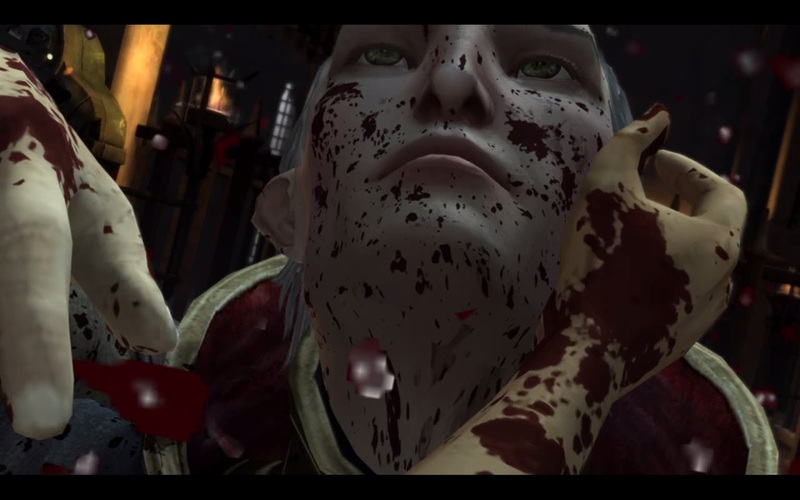 When the battle ends, Hawke then must decide Anders' fate. Depending on their relationship, he will reveal his reasoning, explaining that the Grand Cleric would only have continued to prolong the conflict with her inaction, noting that, according to Mother Petrice, Elthina had refused Meredith's request for Anulment several times. Upon further investigation, Hawke realizes that Anders has been used by Petrice to murder Elthina and condemns him for the deaths of innocents in the Chantry and all those who will die in the upcoming battle. Hawke may allow him to escape, which will cause Sebastian to leave, demand that Anders fight at her side and, should he survive, submit to justice for his crimes, or she can kill him - though she will do so face-to-face. Hawke and her companions battle their way to the Docks and head over to the Gallows where a battle is already raging. Orsino a truce, offering to let Meredith take him alone and spare the mages of the Circle. Something passes between them and, for a moment, it seems like Meredith will allow this, but then her resolve returns and she refuses, telling him to prepare. The two sides separate. 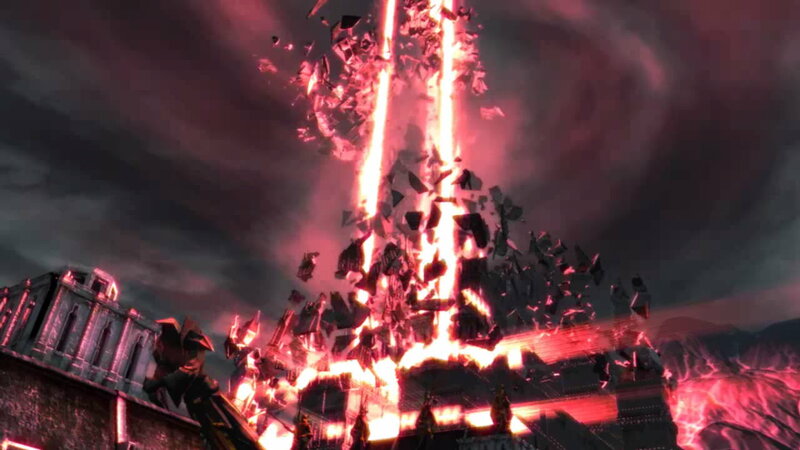 If Hawke sides with the mages, then they will retreat to the Circle Tower where Hawke may converse with her companions before the battle begins. When she speaks with Orsino, he will explain that he intends to fight alone, not wishing to risk his mages, who are innocent of any wrong doing. When the battle begins, templars will attack in waves and, when it seems like Hawke and her companions are losing, Orsino will ask Hawke's forgiveness and warn her to do what she must. He then uses blood magic and the fallen templars to transform himself into a Harvester, destroying the remaining templars, save for Meredith, before turning on Hawke and her companions. Meredith will express rage that quickly turns to sad regret for pushing Orsino to this point. For the sake of this battle, Meredith will fight along side Hawke, delivering the final blow to the monster with her enchanted sword. After this, in a bloodrage, she will turn on Hawke. If Hawke sides with the templars, then they will fight their way through mages, demons and shades to the entrance of the Circle, where they find Orsino alone. He surrenders, wanting no more death for his mages. Meredith attacks him, and, before Hawke can stop her, she runs him through with her enchanted sword. Meredith's rage will quickly turn to regret for what she has done and she will hold Orsino tenderly. Orsino touches her face and says that he forgives her, believing that the woman she once was is not lost before dying in her arms. Rage overcomes her again and she turns on Hawke. In either case, when Cullen arrives with templar reinforcements, Meredith accuses Hawke of blood magic, if she is a mage, or of conspiring with blood mages and demands her immediate execution for her part in all of this. Cullen will interject, but Meredith, turns her lyrium idol sword on him and accuses him as well. Cullen (and Carver, if he is a templar) will come to stand in Hawke's defense. When Meredith is defeated, no matter what side she chose, Cullen and the templars will kneel before her in respect and Varric's narration will reveal that Hawke becomes the Viscount of Kirkwall.